Texas A&M beat Nebraska 9-6 yesterday. Excitement. At least for Aggies fans, who stormed the field. And for an Aggie photographer, who claims Cornhusker D coordinator and the head coach's littler big bro Carl Pelini got all grabby, pushy, breaky with him. There's video here, but no embed code that I can see. It doesn't show much besides creepy lil sparkplug fella before what seems like an off-frame charge and shove that sends the camera a'tumbling. At the conclusion of the game, I ran out onto the field with my video camera to capture the post celebrations of the players and coaches. When I reached approximately mid field (near the east hash marks), I came upon Carl Pelini verbally lashing a gentlemen on the field. 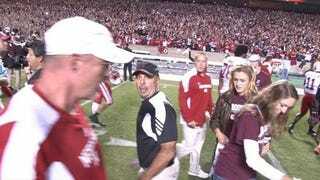 I directed my camera toward the commotion and captured the Nebraska coach as he began to walk away. As Carl turned, his eye caught my camera and the fact that I might have captured some of the exchange. What happened next was truly bazaar. From about 10 feet away, he charged straight for me and for the camera that I was holding. By the time he reached me, I already had my camera by side. He grabbed the camera and I battled to maintain possession of it. Unable to gain possession of it, he broke the eye piece off in several pieces and threw them into the surrounding crowd. He then stormed off. The surrounding crowd helped me recover the pieces of my camera. Also, there is no audio because, like an idiot, I forgot to put the shotgun mic back on the camera after coming down from the photo deck with 3 minutes remaining. As a result, I got zero audio.